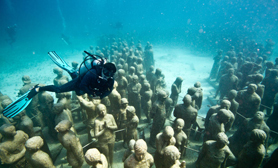 Combining art and nature, Cancun Underwater Museum by Sculptor Jason de Caires Taylor has created underwater museums (known locally as MUSA) off the shores of Punta Cancun, Punta Nizuc, and Manchones Reef in Isla Mujeres. His main body of work features more than 400 lifelike statues that serve as artificial reefs to attract marine life. The displays have conveniently been placed in shallow areas for viewing by divers, snorkelers, and glass-bottom boats. Acting as a restoration project, this artificial habitat also helps restore the natural reefs that have suffered damage over the years. Excursions & Trips are available to the Cancun Underwater Museum here.